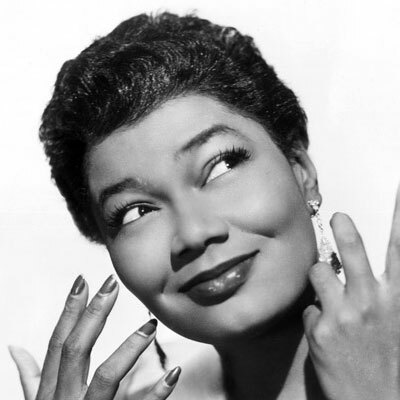 An uninhibited vocalist who gave more to her performances than any other singers around, Pearl Bailey gained fame for her work in Broadway, cabaret, and Hollywood. Bailey's sultry, slurred delivery livened up many a stale standard, including "Baby It's Cold Outside" and her only hit, "Takes Two to Tango." The daughter of a preacher, Bailey began singing at the age of three (her brother, Bill Bailey, also taught her a few dance steps). She was performing professionally by her early teenage years and after touring as a dancer for several years, she featured both as a singer and dancer with jazz bands led by Noble Sissle, Cootie Williams and Edgar Hayes. She began performing as a solo act in 1944, and wooed nightclub audiences with her relaxed stage presence and humorous asides. After briefly replacing Sister Rosetta Tharpe in Cab Calloway's Orchestra during the mid-'40s, she debuted on Broadway during 1946 in the musical St. Louis Woman. Bailey earned an award for most promising newcomer, and made her first film, Variety Girl, in 1947. Though it wasn't a hit, her version of "Tired" (from Variety Girl) increased her standing in the jazz community. She recorded for several different labels, including Columbia, during the '40s and finally found a hit in 1952 after signing to Coral. Her version of "Takes Two to Tango," backed by Don Redman's Orchestra, hit the Top Ten. That same year, she married drummer Louie Bellson, and he left his position with Duke Ellington to become her musical director. Bailey recorded several albums for Coral during the early '50s, and starred as a fortune-teller in the 1954 film Carmen Jones. More starring roles followed, in the W.C. Handy biopic St. Louis Blues as well as the first filmed version of Gershwin's classic operetta Porgy and Bess. In 1959, a new recording contract (with Roulette) resulted in a change of direction. After her double-entendre LP For Adults Only was banned from radio play, it became a big seller and occasioned a string of similar albums during the early '60s. She continued to perform on Broadway, and won a Tony award in 1970 for her title role in Hello, Dolly! She led her own television variety show in 1971, but retired from active performance several years later. Pearl Bailey was named to the American delegation to the United Nations in 1976, and awarded the Medal of Freedom in 1988.